1. Parsing - validate SQL syntax and convert to internal form. 3. Validating - validate SQL semantics based on metadata references and type signatures. This article mainly dive into the underlying of these components. If debug the DQPCore, set a breakpoint to this method is smart way. The DQPCore start initialize lots of necessary components which used in Teiid Engine, it mainly including BufferManager initialize, TempTableDataManager initialize etc. The executeRequest() is the entrance of any Client SQL Request. A simple message holder org.teiid.net.socket.Message (which wrapped the this method’s name, request ID and the RequestMessage) received by transport layer(netty server), then DQPCore’s executeRequest() be invoked by java reflection. addWork() - invoke ThreadReuseExecutor’s execute, “RequestWorkItem” be passed as parameter. execute() - A RunnableWrapper be fistly created, then invoke executeDirect(), RunnableWrapper be passed as parameter. 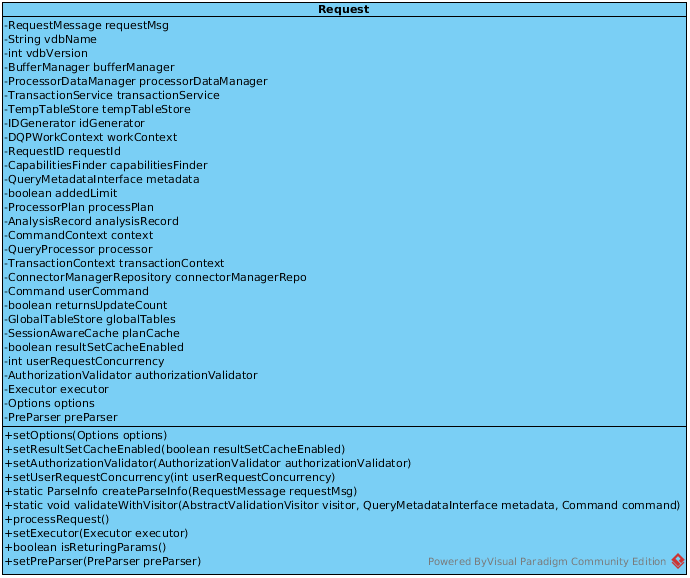 RequestWorkItem’s run() has more details about query plan running. DQPCore supply a static public method executeQuery(), which used to execute the given query asynchly. keep all Session, connection information related information before Request be transfer to Processing Threads. Supply the interface to run Callable and Runnable task. TempTableStore - act as full resource manager. Also, the requestId, connectorManagerRepo which contains connection info be initialize. This method invoked by Netty NIO Work Threads(more details about thread pools in Teiid Engine). 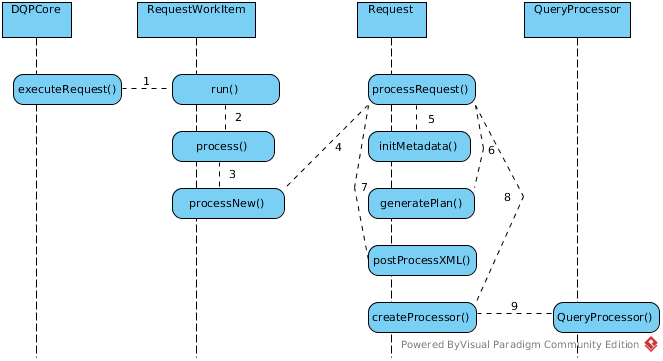 After Request and RequestWorkItem be initialized correctly, Request’s processRequest() be invoked by Process Worker Threads(more details about thread pools in Teiid Engine). 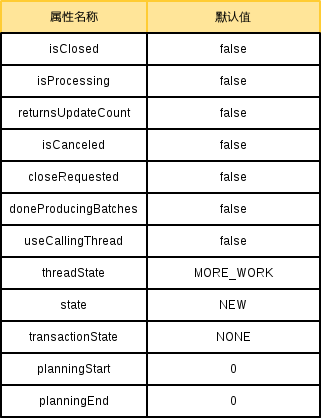 processRequest() is the key operation method. This method will finally create org.teiid.query.processor.QueryProcessor, which wrappered a org.teiid.query.processor.ProcessorPlan(Refer to Process of generate a ProcessorPlan for more details). initialize a CapabilitiesFinder, used to to find connector capabilities. initialize a QueryMetadataInterface, used to get metadata in runtime, refer to Understanding Teiid Metadata for more details. initialize a GlobalTableStore, use to get TableStore and metadata. The ‘capabilities’ means underlying sources’ capabilities, these capabilities mainly depicted by translator, each translator has defined a series of properties used to depict the capabilities of source. The CapabilitiesFinder has implementation org.teiid.dqp.internal.process.CachedFinder and org.teiid.query.metadata.TempCapabilitiesFinder, the process Request initialize Metadata initialize the TempCapabilitiesFinder which contain a delegate CachedFinder. GEnerate Plan first create a CommandContext which carry the processing related information, including GlobalTableStore, ProcessorBatchSize, etc. Refer to Process of generate a ProcessorPlan for details. TempTableStores are transanctional, but do not act as full resource manager. This means we are effectively 1PC and don’t allow any heuristic exceptions on commit. 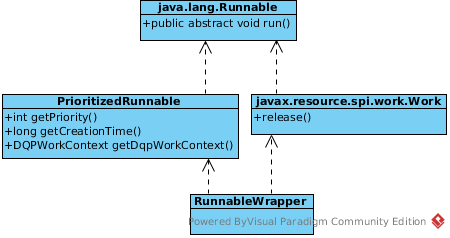 Table state snapshoting and a javax.transaction.Synchronization are used to perform the appropriate commit/rollback actions. NOTE: refer to link for more about JTA Synchronization. Netty Worker Threads - the work related with Engine Process are execute DQPCore’s executeRequest() method, init the Request and RequestWorkItem, then start the RequestWorkItem which wrapped a active processor plan. maximumPoolSize is 2147483647 means the maximum number of threads to allow in pool is 2147483647.
keepAliveTime is 2 and time unit is minutes means the idle threads will be keep 2 minutes then be exit. Source Query Worker Threads - Used to retrive tuple’s from DataSources, interacted with Connector layer(translator and resource adapter) via ConnectorWork API. Learn more from sequence diagram. Source Query Worker Threads also maintained by processWorkerPool. //TODO– finished at processNew(), next time start from BatchCollector create. This should only be called from Process Worker Threads, ResultsReceiver’s receiveResults(T results) method be invoked, set the results to org.teiid.client.util.ResultsFuture’s result if they have been requested. When the query engine receives an incoming SQL query, it be processed to Request’s generatePlan() method, this method will create a ProcessorPlan(UML diagram), which is a set of instructions created by a query engine for executing a command submitted by a user or application. The purpose of the query plan is to execute the user’s query in as efficient a way as possible. SQL come from RequestMessage which transited from Client. ThreadLocal QueryParser has a parseCommand() method, which can parse SQL String to internal form, eg, org.teiid.query.sql.lang.Command, refer to link for more forms. NOTE: QueryParser has a javacc SQLParser.jj based SQLParser, the parse result is a Command Object. QueryResolver contains a series of CommandResolver(UML) which used to implement Resolver by SQL Types(queries, inserts, updates and deletes). A org.teiid.query.validator.ValidationVisitor is used in Validating, ValidatorReport contain result of Validating. The aim of Rewriting is rewrite commands and command fragments to a form that is better for planning and execution. For example, language object From’s clauses list not setted by default, Rewriting will do it. NOTE: Phase 1 create a logical plan, Phase 2 update logical plan, Phase 3 convert logical plan to processor plan. This step will convert internal Command to a PlanNode. Refer to Direct Query Source Model Accounts for more details. A PlanNode mainly consist of 3 parts: type, parent PlanNode and children PlanNode list. NOTE: The PlanNode in this section is under org.teiid.query.optimizer.relational.plantree, which different with org.teiid.client.plan.PlanNode. The further Optimizing, all changes are add on PlanNode, two steps involved: build a LIFO Rules stack and execute Rules. 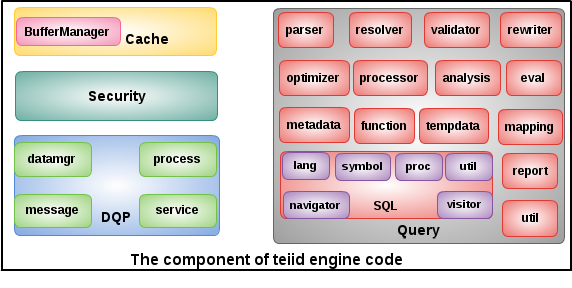 Start from Teiid 8.13, there are 28 rules existed, the complexity of rule stack depend on the complexity of sql query, the more complex of sql query(contain join, complexed sub-query, complexted criteria), the more complex of rule stack. 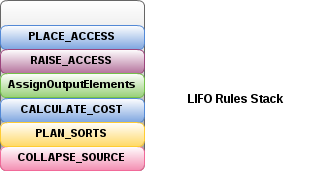 However, as below figure, CollapseSource, PlanSorts, CalculateCost, AssignOutputElements, RaiseAccess, PlaceAccess are the minimal rule stack pattern. NOTE: The sql query SELECT ID, SYMBOL, COMPANY_NAME FROM Product will execute only these 6 rules. Note that he rules in Stack executed in a LIFO order, this section will use the rule stack as a example. This rule attempts to raise the Access nodes as far up the plan as possible. This is mostly done by looking at the source’s capabilities and determining whether the operations can be achieved in the source or not. This rule walks top down through every node and calculates the output columns for each node. Columns that are not needed are dropped at every node, which is known as projection minimization. This is done by keeping track of both the columns needed to feed the parent node and also keeping track of columns that are “created” at a certain node. This rule adds costing information to the plan. This rule optimizations around sorting, such as combining sort operations or moving projection. This rule takes all of the nodes below an access node and creates a SQL query representation. NOTE: so far, the PlanNode be updated completely, rule-based optimization finished. 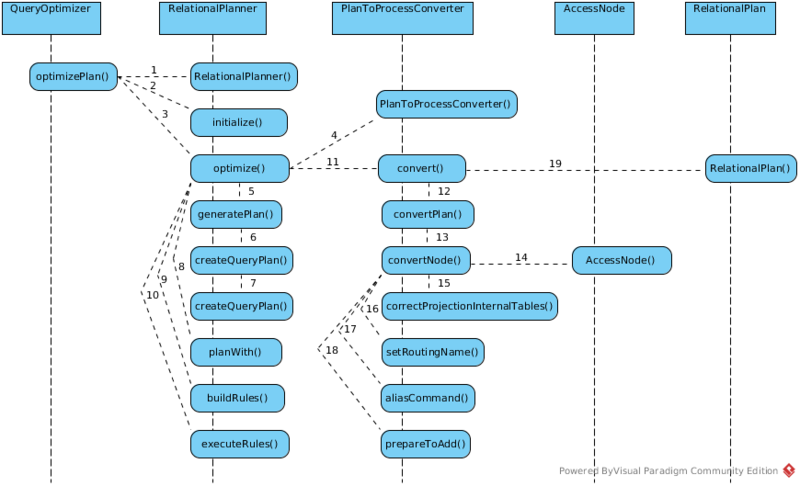 Run PortfolioQueryPlanner as java Application will simulate these steps. As above Generate canonical plan genrated a canonical plan firstly, which represent by a PlanNode, then as optimization, canonical plan be optimized by optimization rule stack, after these 2 steps finished, plan to process converter will start. 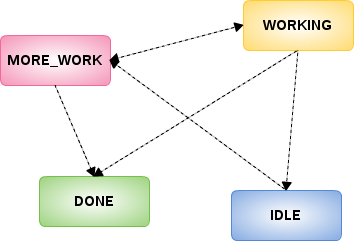 The results of this step will produce a ProcessorPlan(UML diagram). Start Source Query Threads to return a FutureTask which bound a AtomicResultsMessage(1 -> 2 -> 3 -> 4 -> 5 -> 6 -> 7 -> 8 ->9). Check the FutureTask, get the Tuples from AtomicResultsMessage, assemble all Tuples to a TupleBatch(10 -> 11 -> 12 -> 13 -> 14). Manipulate TupleBatchs to a TupleBuffer(15 -> 16). As Appendix-1, the usual processing procedures are like: create a AtomicRequestMessage, check the Cache, create a DataTierTupleSource, but if modelName parameter is SYS or SYSADMIN, the processing directly goes into processSystemQuery. The above code copy from DataTierTupleSource’s asynchGet() method. NOTE: DataTierTupleSource are the interactive layer used to interact with Connect layer, which connects, loads the data source. NOTE: Asynch Query related with a FutureResult.